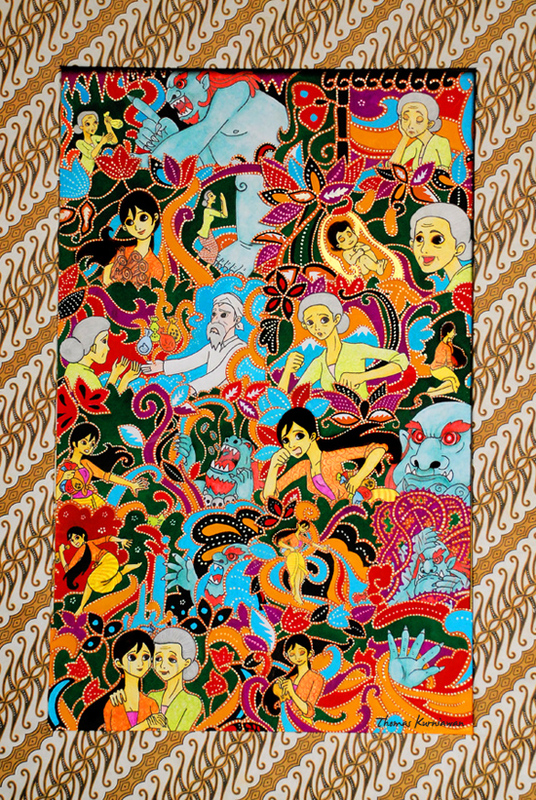 Timun Mas based on central Java’s Folktales . This t start from a single old woman who hasn’t child. Her lonelyness makes her go to the magic cave to meet the great green giant. She Ask him about a child, and the giant will give her a child with a requirement that one day if that child has grown, he will take it back for being his food. Then the old woman agree and the giant give her a cucumber seed. The old woman back to her house and plant that seed. In view days that seed has become a large golden cucumber, then she cut it and get a female baby in there. The old woman named her Timun Mas. Timun Mas grow fast and well. She become a pretty lady without know about the agreement of her mother with the great green giant.The old mother very loves her, and this feeling makes her feeling guilty. She prays to God to ask forgiveness about her foult wich makes an agreement with evil. Finaly God send a wise old man to meet her. That man gives her for pockets which cucumber seeds, needles, salts and terasi (indonesian traditional flavour) in them. One day that old woman tell about the truth to Timun Mas, Timun Mas feel sad but She forgive her mother because she has known that her mother feel guilty with her foult. Her mother gives her those pocket to survive from the great green giant. In Timun Mas’ 17th birthday, the great green giant comes along to take her out. Timun Mas run out with those pocket. To survive her self from the giant, she throw the pocket one by one. the first one, the pocket with cucumber seeds make cucumber wood. The second one, the pocket with needles make thorn. The Third one, the pocket with salt make an ocean, but the giant hasn’t died yet, until she throw the last pocket with terasi in there. It makes a pool with full of hot mud. Then the giant sink in there and die. And then Timun Mas her mother live happilly ever after.